We offer the perfect location for you to enjoy romance on your Grenada honeymoon. Once you arrive at Petite Anse, you will be welcomed with chilled champagne in your room with fresh flowers. We will arrange two trips for you to romantic beaches on the island where you can enjoy the beauty of Grenada. We can also arrange massage treatments in your room in addition to a romantic and intimate dinner for two on your private verandah or on our oceanside terrace. 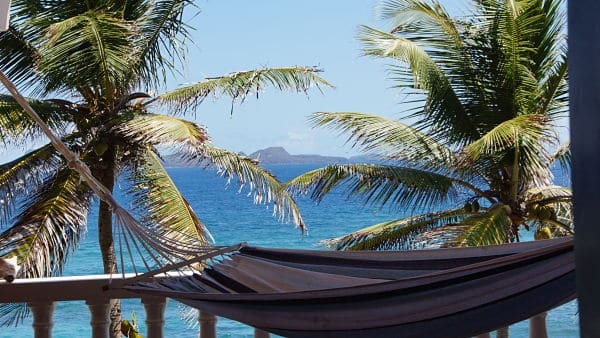 Our honeyymoon suites are known as the Grenadine Rooms as they have marvellous views over the Grenadines. If you don’t see what you would like in our package, we are open to your ideas and will arrange your special time together to suit your wishes. All packages are subject to availability and subject to change. This special offer cannot be taking in conjunction with any other special offer. To book, email us here at Petite Anse. There are plenty of opportunities for romance in Grenada, the beaches are magical with soft white sand. The perfect spot to spend quality time together. If you prefer to be more active, then there is plenty to do and see with hiking, turtle watching, snorkeling, diving and tours. We can organise a day trip for you to Sandy Island, an island that can be described as ‘paradise’. You’ll travel out to the uninhabited island with local fishermen who will spearfish your lunch for you and BBQ the catch with herbs and seasonings so that you can get a taste of the real Caribbean. You’ll also be able to drink from the refreshing jelly water coconuts that grow on the island. As part of your stay with us here at Petite Anse, we can also arrange for you to picnic on local beaches and to enjoy an intimate dinner for two served on your private verandah. Here are some other ideas of things to do on your Grenada honeymoon. All honeymoon packages are subject to 10% government tax and 10% service charge. Full English Breakfast is included in all the above rates.